A favorite, USATT approved choice for schools, recreational facilities, and families, the Tour 1800 features a ¾ inch (18mm) painted medium density fiberboard (MDF) surface. Our multilayer paint process prevents chipping and warping while creating the ideal surface for a consistent ball bounce and accelerated gameplay. The sturdy, powder coated 40mm frame and 40x40 mm undercarriage acts as a shield from excessive wear and tear and thus increases the table’s lifespan. The Tour 1800 comes nearly preassembled in two halves facilitating set up and take down, with only 8 bolts needing to be tightened to attach the legs. Each individual half of the table comes with its own trundle system to allow for easier transport and ability to stand alone, as well as be nested together to minimize storage space. This is the second table tennis table in the pro-recreational range made by JOOLA. They have three tables in this range, the Tour 1500, Tour 1800 and the Tour 2500. The 40mm metal undercarriage is better and stronger than the tour 1500 table. The thicker 18mm table top also provides a more stable bounce. The table also comes with automatic folding legs and as is standard, the Joola Tour 1800 comes with a double anti-tilting feature which is a great safety feature. If you’re having fun with friends and anyone leans on the table it won’t collapse! The table was made to fold up for easy storage and the wheels lock. The table weighs 226 pounds, so the Ping Pong Experts think it’s best to have two people set up this wonderful table. The whole assembly takes about 20 minutes to set up and tighten 16 nuts and bolts on the legs. The sturdy 1.5-inch frame and undercarriage are built with heavy-duty welded steel and will give the table a much longer lifespan than other table tennis tables. And the craftsmanship is on par with any other table in its price range. This is a high-quality ping pong table that will last for years. It's all about affordability and usability. Keep in mind that the difference between the 1500-1800 and 2500 is the thickness of the table top. 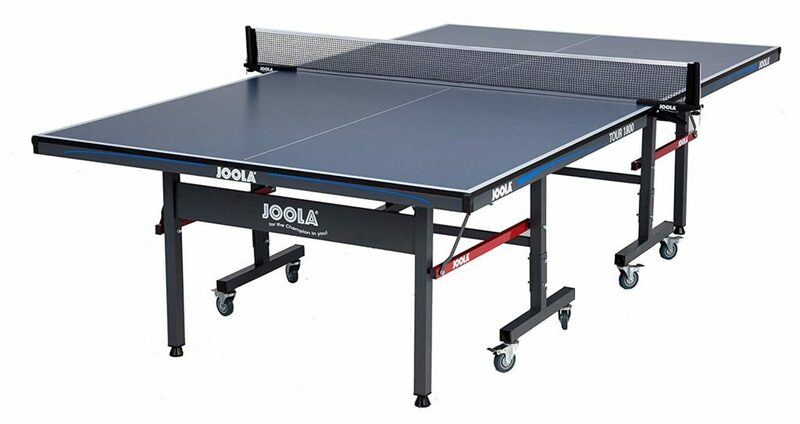 This JOOLA Tour 1800 may not provide you with the same bounce quality which other competition-level or professional table tennis table will provide you with. Nonetheless, the bounce is still considered very good for the price and quality!